A wetland is more than meets the eye. Despite some people’s view as a “mucky area that is a breeding ground for mosquitoes” they play an important role amongst our ecosystems. They protect and improve water quality, provide fish and wildlife habitats, provide food sources, store floodwaters, and maintain surface water flow during dry periods. Taking on all those roles makes it an important contributor to the ecology of watersheds. According to the EPA the combination of shallow water, high levels of nutrients and primary productivity is ideal for the development of organisms that form the base of the food web. Those organisms feed many species of fish, amphibians, shellfish and insects. Many species of birds and mammals rely on wetlands for food, water and shelter, especially during migration and breeding. One specific plant species is threatening this ecosystem symbiosis, Frangula alnus, commonly known as glossy buckthorn. This plant species came from Europe and Asia, it was thought to be a good species to form hedges and food for wildlife as well as cover. It was observed as an invasive species because of its tendency to grow in dense thickets and ability to displace the native plant species in the area. It is a particular pest on wet sites and poses a significant threat to Michigan’s rich prairie ferns, as well as other wetland communities. It is also successful on upland sites including old fields, roadsides and open woods. Glossy buckthorn is an alternate host for alfalfa mosaic virus and crown fungus, which causes oat rust disease. It has also been implicated as a possible host for the soybean aphid. 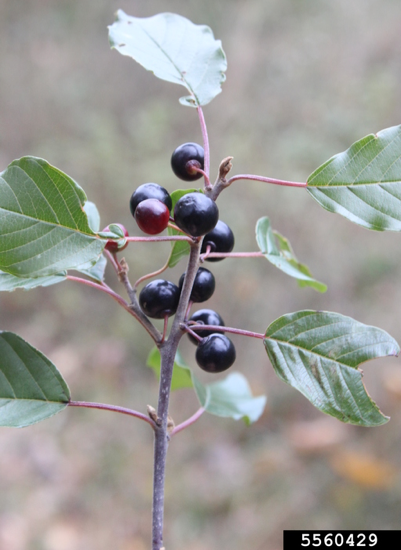 Glossy buckthorn is a small tree or shrub that can get up to 20 feet tall, and 10 inches in diameter. It has simple, shiny leaves, with 8 or 9 pairs of veins and untoothed margins. The leave pattern is alternate. The bark is a grayish brown color with light splotches or spots on it. If you were to scratch back the bark with a pocket knife the inner bark would be a yellowish-orange color. Despite its name the shrub does not have thorns. The potential for spread is great due to the berries that form from July through September, birds and small mammals enjoy consuming and transporting these berries. The seeds can remain viable in the soil for several years. Controlling this species is up to what the landowner prefers. Cutting or mowing mature glossy buckthorn shrubs stimulates resprouting unless the cut surfaces are treated with herbicide. Mowing may be helpful in maintaining open areas by preventing the establishment of the buckthorn seedlings. In most cases, effective control of glossy buckthorn requires the use of herbicide. 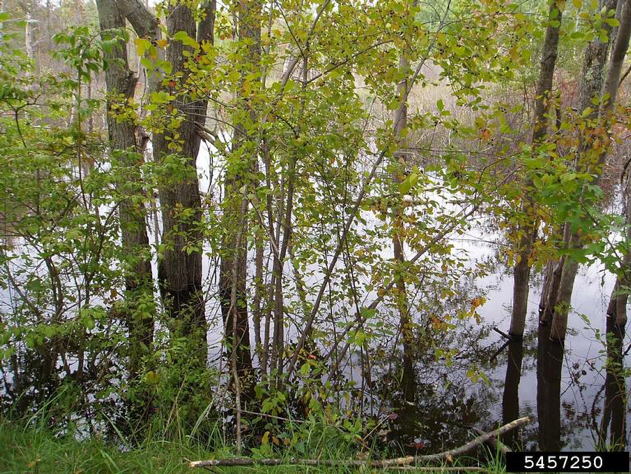 Factors that should be considered when selecting an herbicide for use on a particular site include proximity to water or wetlands, presence or absence of desirable native vegetation, potential for erosion and the effectiveness of the herbicide under consideration on glossy buckthorn. Fall treatment reduces impact of any desired native plants because glossy buckthorn remains green much later than many native species. For more information about the NCCISMA, visit our website at www.northcountryinvasives.org.